In addition to the major sights of Munich, we will visit the most modern soccer stadium in Europe, the “Allianz Arena” – venue for the 2006 World Cup Championship. A visit to the FC Bayern Grounds will follow. On match days no visit to the Allianz Arena possible. As an alternative we visit the VIP area of Olympic Stadium and Olympic Park. 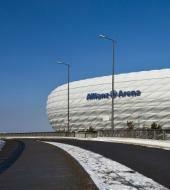 On match days no visit to the Allianz Arena possible. As an alternative we visit the VIP area of Olympic Stadium and Olympic Park.